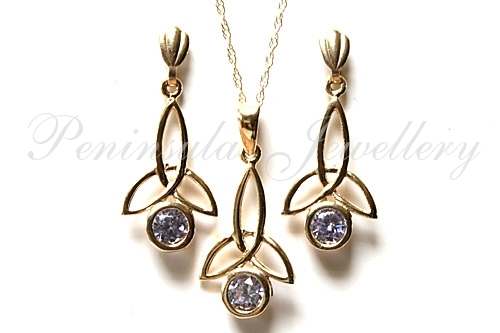 Pendant; A pretty pendant featuring one 4mm round cut Lilac Cubic Zirconia gemstone set into a 9ct gold celtic design. Dimensions: 22mm drop including bail, 10mm wide at the widest point. Complete with 9ct gold 18" Prince of Wales chain. Earrings; Pretty earrings set with Lilac Cubic Zirconia gemstones. Each earring features one 4mm round cut Lilac Cubic Zirconia set into a 9ct gold celtic design. Dimensions: 22mm drop including post, 10mm wide at the widest point. Standard posts and scroll backs in 9ct gold. Made in England. Presented in a luxury gift box – Great Gift! !